Throughout the day, we’ll construct several projects to practice techniques and to get familiar with the materials. 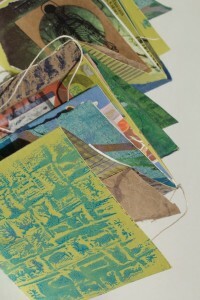 A large assortment of scrap papers, collage materials…random bits of all sorts will be available. Think about adding your own photos, personal artifacts, and ephemera to the mix! Materials fee $25, payable in class. More info & Sign up !! !